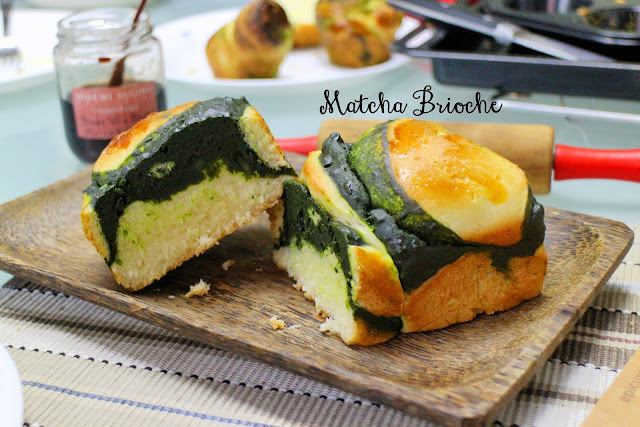 I first saw the recipe for matcha brioche on Foodbeam, now known as the Strawberry Milk. The author, Fanny, also has her own cookbook (Le Paris Pastry Club) now which I am so tempted to buy (maybe when I get my first paycheck? Haha). I love her retro-vintage photography style mixed with her own sketches and cursive typography. The second time I saw this recipe was on Vintage Trinkets. I get inspired by all of Chelle’s pretty photos every single time. 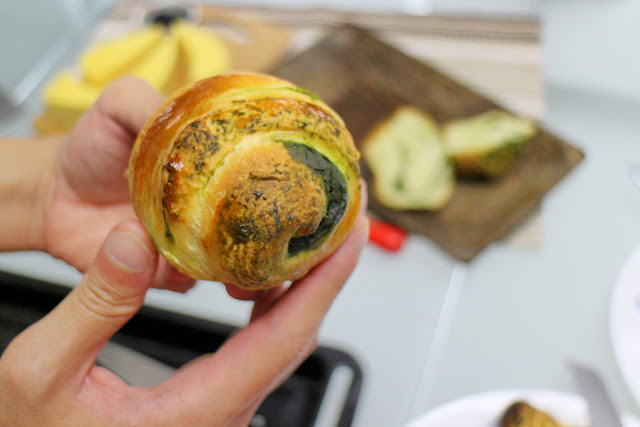 We also overbaked the mini brioches, which tasted a bit dry at first but I realise we made the mistake of slicing it within the first 30 minutes after it was pulled out of the oven. The steam escaped resulting in drier bread. So remember, WAIT! The larger loaf we had was closer to perfect- soft, fluffy and fragrant. Additional tips I would give to build on what Fanny provided: Like what Chelle says, the green tea slush is easier to handle if you freeze it. Also, be sure to cook it until it becomes a thick slurry because it’s not supposed to be too watery before you dump it into the freezer. If you are planning to keep the brioches for the next day, seal it in a ziplock bag. 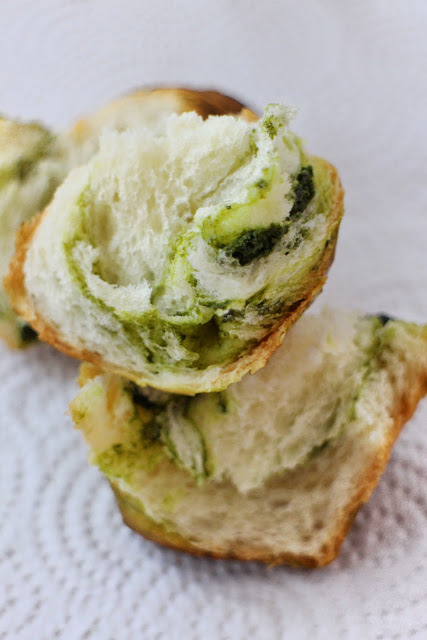 Before consumption, buzz it in the microwave for 15sec or toast it in the oven (I read that it’s good to sprinkle some water on your bread if you are toasting it to keep it moist, but I haven’t tried this method). I find that when I microwave, the bit touching the plate gets wet so as soon as I pull it out, I quickly dump it on a paper towel to absorb any moisture. 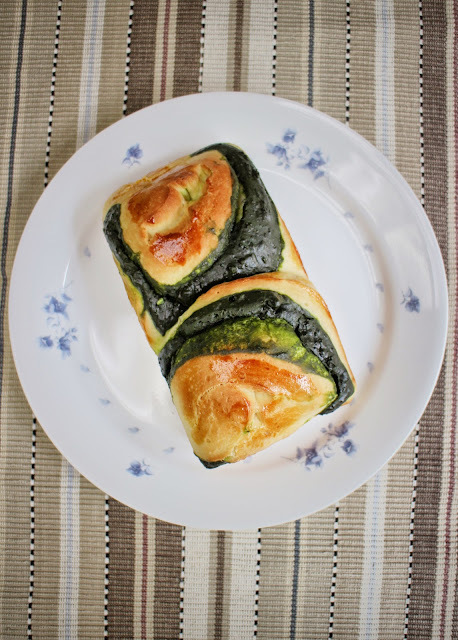 Next time, instead of a brioche (note, this recipe yields a light brioche, it uses much less butter as compared to a traditional brioche recipe) I would go with a normal white bread using a tang zhong starter (also known as the water roux method). I’ve attempted it with relative success and I think it will go well with the green tea dough (or maybe I’ll modify it for a cinnamon dough since it’s my bestie’s favourite ^^).